The Amalfi Coast was my favourite seaside area of Italy. I stayed in Sorrento but the area can be quite pricey so I was also suggested that next time, for a quieter, less touristy area that will still allow for easy transportation around the Amalfi Coast to also try looking for accommodation in Salerno. 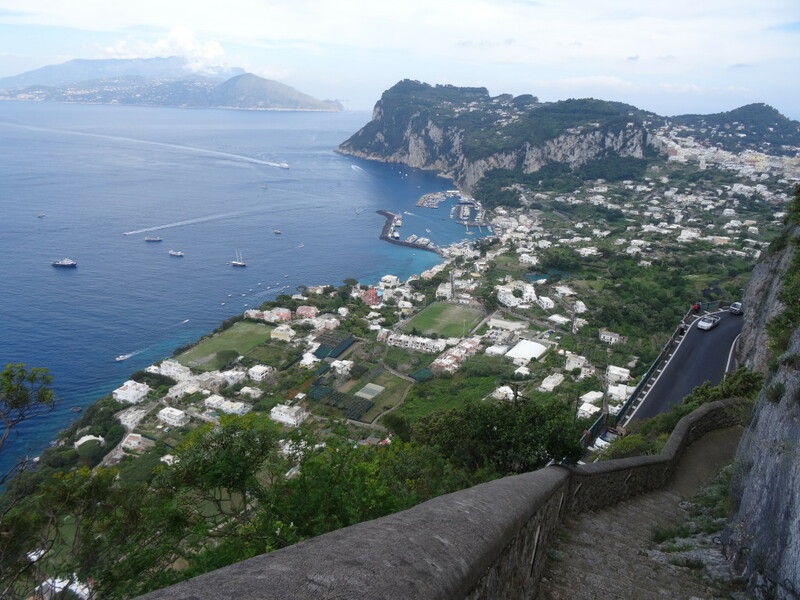 While staying in Sorrento I did day trips to Pompeii, Positano and Capri. The Amalfi Coast was my next stop after finishing travelling through the Cinque Terre, and I am glad I did it this way around as while Cinque Terre was very pretty, I thought in particular, Positano and Capri were on another level was just taken away by the astonishing beauty of the Amalfi Coast. Positano was extremely picturesque and relaxing. The strikingly colourful and dainty bougainvillea set against the clear blue ocean and pastel coloured patchwork wall of hillside homes is a truly stunning site reminiscent of the opulence and elegance that this wealthy seaside town exudes. 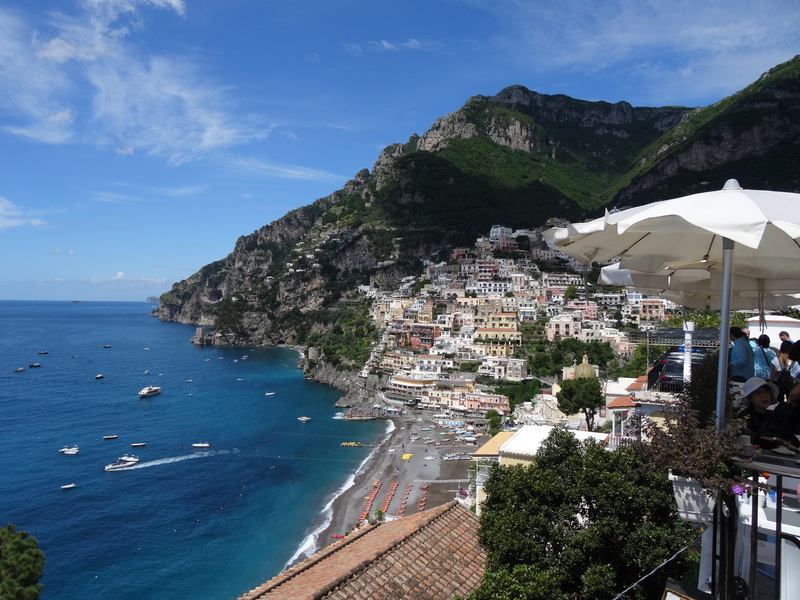 Positano is a perfectly pretty town to stroll through and shop for handmade sandals and stylish beachwear, dine on creatively presented food, stop for a dip in the ocean and explore the hidden pathways and trails. 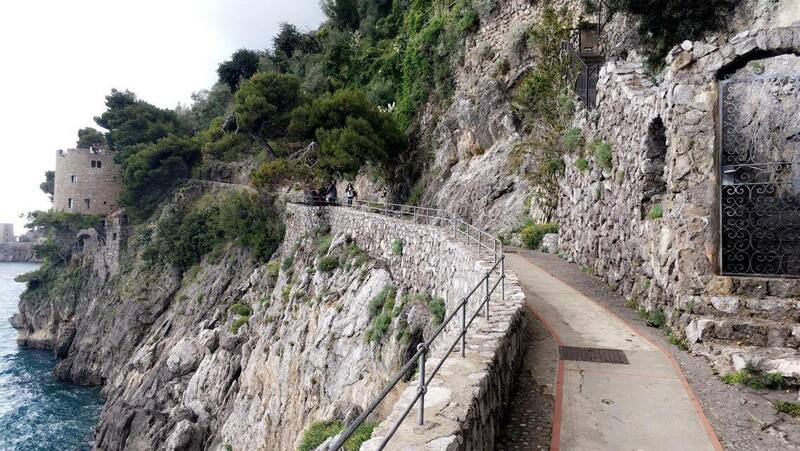 The roads that lead to Positano are extremely narrow and windy. 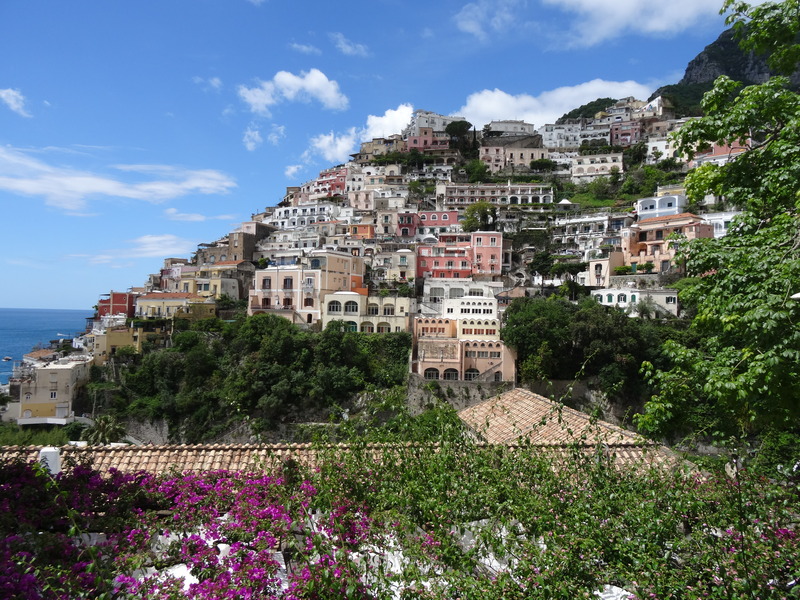 Unless you are a very experienced driver in Italy with these windy roads and are accustomed to the seemingly cavalier local Italian road rules as well as willing to tackle the restricted car parking available, I suggest catching a local coach or a ferry to Positano. 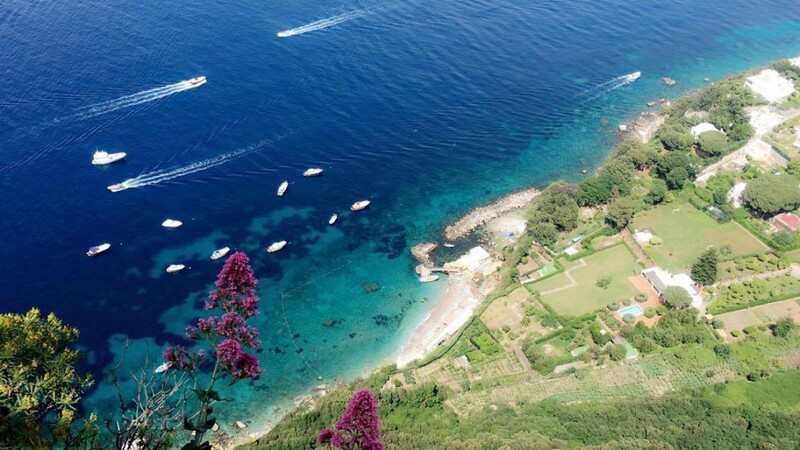 Enjoy exploring the town but also include a stroll beyond the bustling main streets with a walk across the ‘Sentiero degli Innamorati’ or Lover’s Path that leads from Spiaggia Grande (the main beach of Postiano) to the more secluded beach of Spiaggia del Fornillo. On the other hand, if you’re up for a more active hike, try the climb up the Path of the Gods, running along the mountain side with wonderful coastal views along the way. 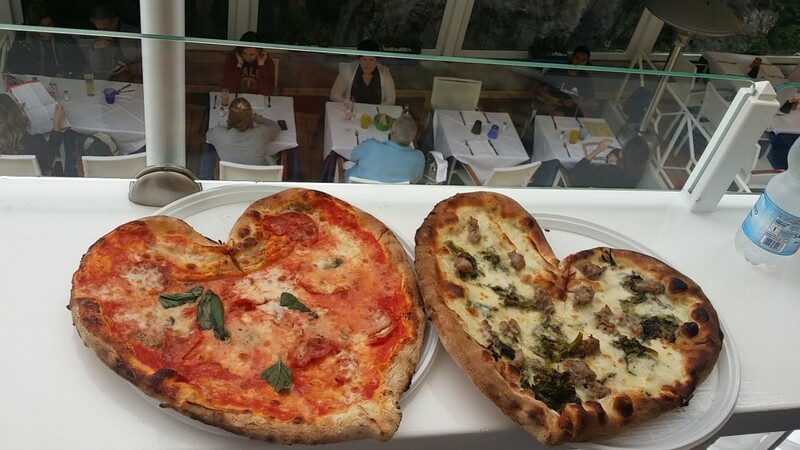 Stop in to Capricci for a slice of heart shaped pizza and a glass of wine. Alternatively, for beautiful waterfront views while you dine, head to Chez Black or Le Tre Sorelle. For a vegetable loaded fresh feast, try Casa e Bottega or for a romantic dinner high on top of the mountain, head to La Tagliata. 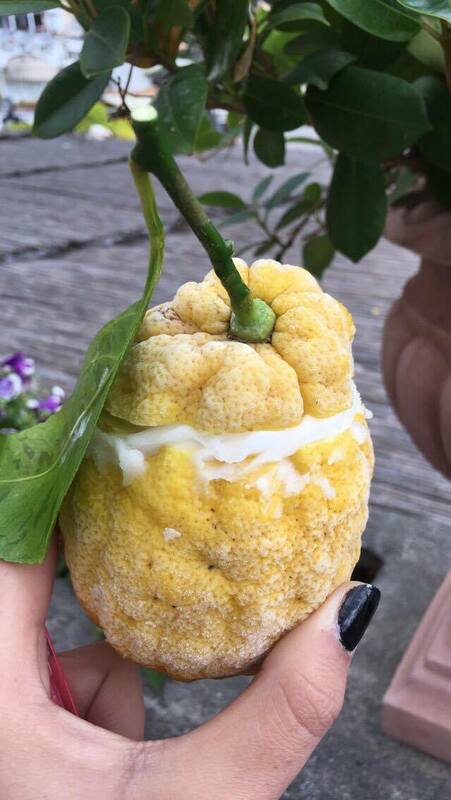 For a droolworthy and delicious refreshment, head to Ristorante Covo Dei Saraceni for a frozen lemon sorbet served inside of a lemon! When planning your trip to Capri, the first thing you should consider is whether you would like to include a visit to the Blue Grotto / Grotta Azzurra. It is advisable if you want to see the Blue Grotto to book it first thing and try and do it first thing in the morning (or check in the morning for tide times and the weather as the ability to enter the Blue Grotto is extremely dependent on the tide and weather so access times will change day to day.) There are a few different boats to take to Capri, I took the public ferry from where I was staying on the Amalfi Coast – in Sorrento. 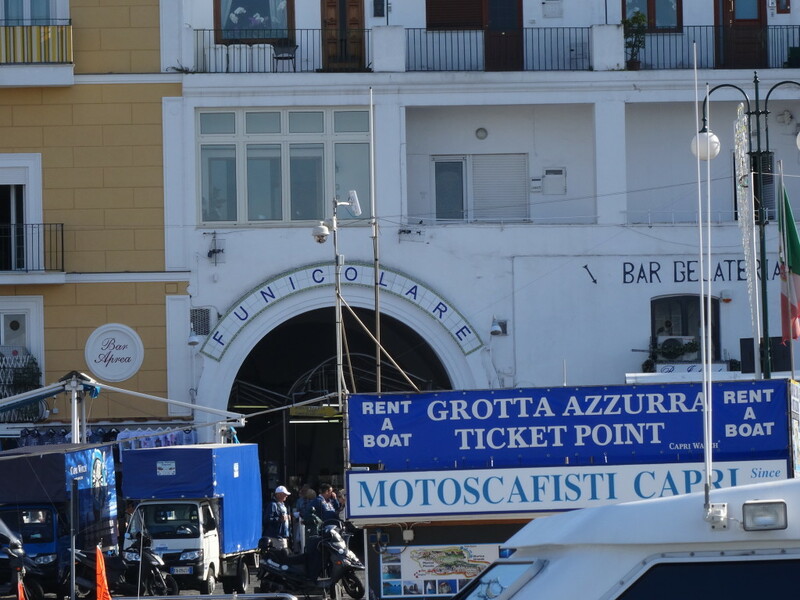 First things first, when you arrive in Capri, if you want to take a trip to the Blue Grotto, dart your way to join the line in the Marina as soon as you get off the ferry. If not, then trust me when I say do not waste any time on the ground level of Capri nearby the marina. 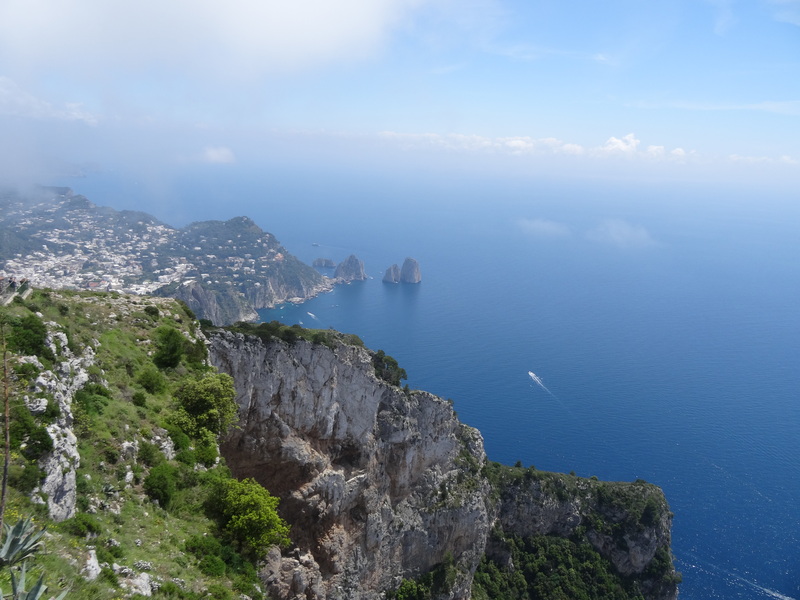 The best and most beautiful way to see Capri is by heading straight to the very top of the island first, to Mount Solaro then spending the day making your way back down again. You will find this will be the least busy and this will be the least tiring method as there is lots of walking to be done exploring the island, and it is much easier to make your way down then try and make your way up the mountain. 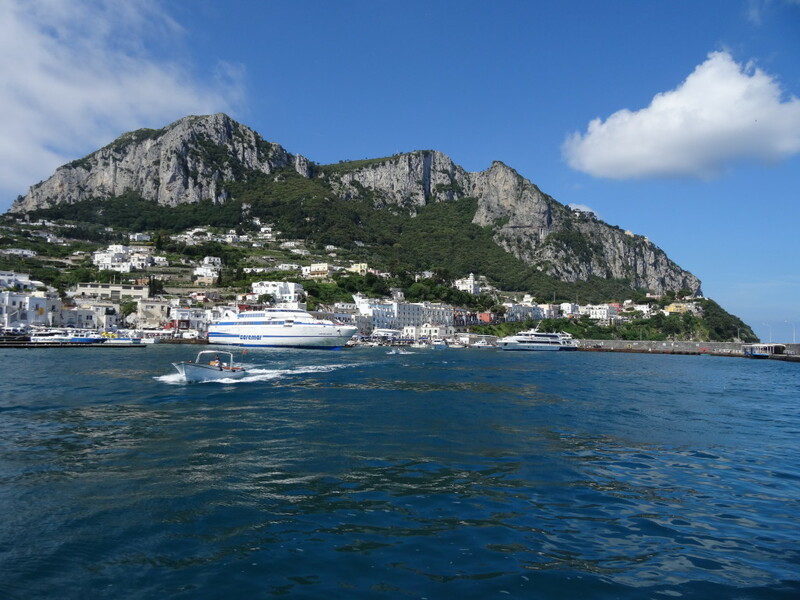 Marina Grande to Capri centre - When you arrive by boat to the island of Capri, you will arrive at the Marina Grande, from here make your way to the ticket sales offices and purchase a ticket to the Funicula. At a cost of €1.80, this railway cable cart is the fastest method to get you to the main centre of Capri, arriving att the Piazzetta. 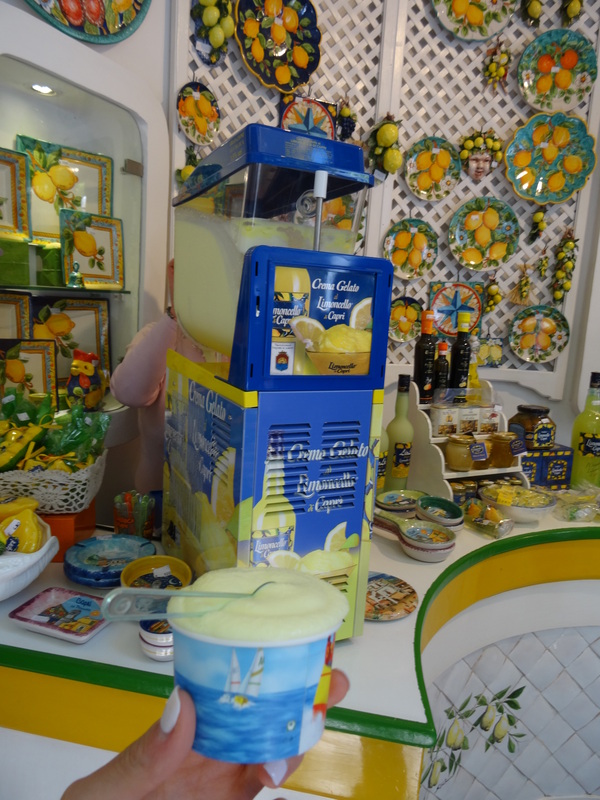 Capri to Anacapri – The Piazzetta is quite busy and filled with many high fashion stores, souvenir shops and touristy restaurants and cafes. But I recommend not spending much time here at first, as there is still a much prettier pocket of Capri awaiting. Once you reach the Piazzetta, purchase a bus ticket for €1.80 at the bus terminal in Capri located in Piazza Martiri d’Ungheria (along Via Roma near the Piazzetta). 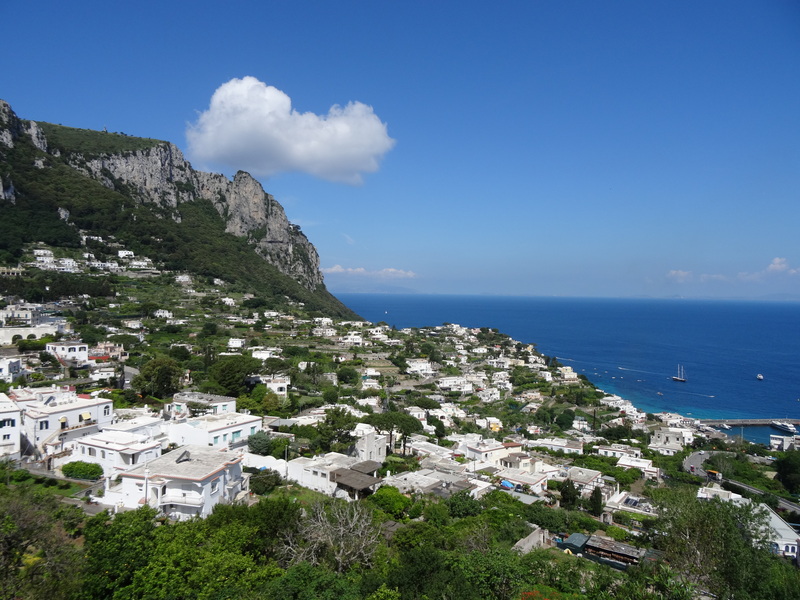 Take the 15 minute bus ride bus from Capri up to Anacapri. You will notice the buses here are tiny, fitting about 10-15 people in each, but luckily they are pretty quick and run regularly. My favorite part of Capri to explore was Anacapri. Stop by for a quick bite to eat or a short break to soak in the beautiful environment and then make your way up to Mount Solaro (as there is only one café on the top of the mountain with limited refreshments and facilities on the top of the mountain). 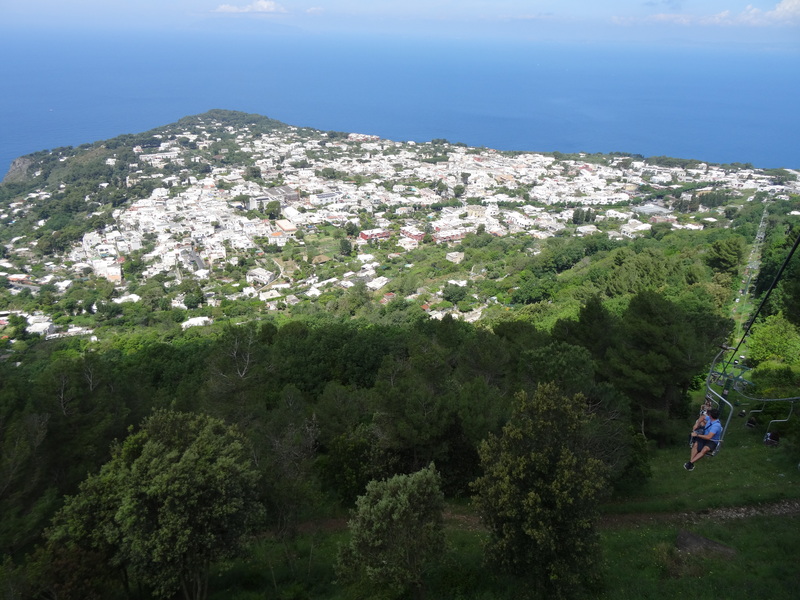 Anacapri to Mount Solaro – The final stage is a climb to the top of Mount Solaro via the chairlift. Fasten yourself in for a breathtaking 12 minute ride with your feet dangling over rooftops and vegetable gardens as you ride up to the 589m ascent above sealevel. The price of the chairlift is €10 roundtrip or €7 one way and I believe it is worth every cent. Once at the top you can enjoy the spectacular views above the clouds along the observation decks before making your way back down the chairlift. We decided to spend the majority of our time after this in Anacapri which was filled with local boutiques and independently owned stores run by locals as well as lots of limoncello and local produce. - Find the Phoenecian steps and see how far you can manage to walk down (and back up!) the incredibly steep steps but don’t forget to stop and take in the astonishingly beautiful view. I would absolutely love to spend more than a day in Capri, so will definitely be planning a return trip to explore even more gems in the area. 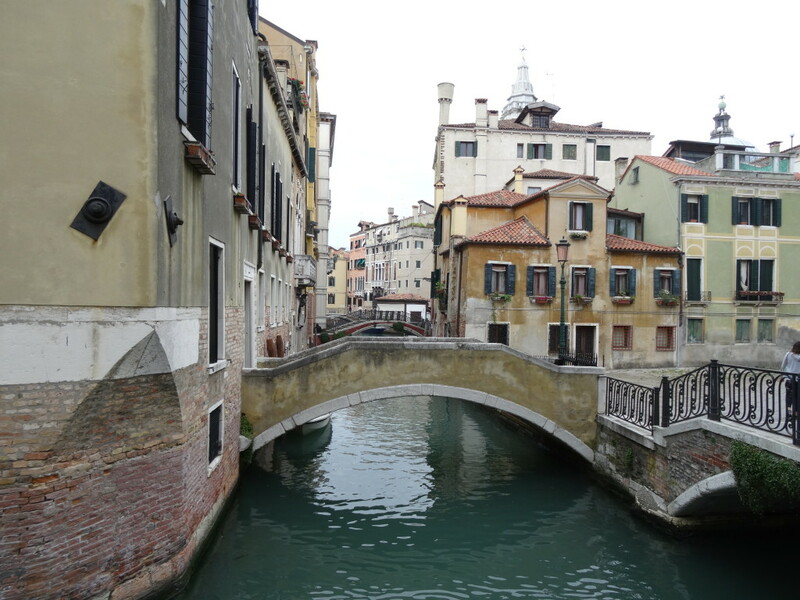 I cannot recommend this free walking tour company enough – La Bussola free tours of Venice were by far our favourite tours of the whole trip. They went beyond the typical sites that you can see on your own and opened up a whole new view of the beautiful city, unveiling many hidden secrets of Venice that we would otherwise have never found. The spots we were shown on this tour ended up becoming some of our most favourite locations! When we took the tours (we ended up taking both the morning and afternoon tours – you can do either or both as they take you to different parts of the city) our tourist guides were young, engaging, extremely knowledgeable and clearly very passionate about the city of Venice. As these are ‘free walking tours’ there is no pressure on how much to pay the tour guides at the end. They were honest and said they work hard because obviously this is their job and they want to impress their tour group to tip them well at the end of the tour, but we were never felt pressured into this, and ended up being very impressed by a tour that we felt the tour guides had put a lot of heart and effort into. The tour guides claimed they do not work with any partnerships with restaurants or places of interest, but instead we found they recommended their own personal favourites spots in the city and places they go to themselves and take their friends to. This was proven the next day when we just so happened to bump into one of our tour guides on his way to meet his friends for drinks at one of his own favourite bars, one he recommended to use the day before. The tours were extremely insightful but at the same time, comfortable like meeting up with a friend and having them take you around their home town. 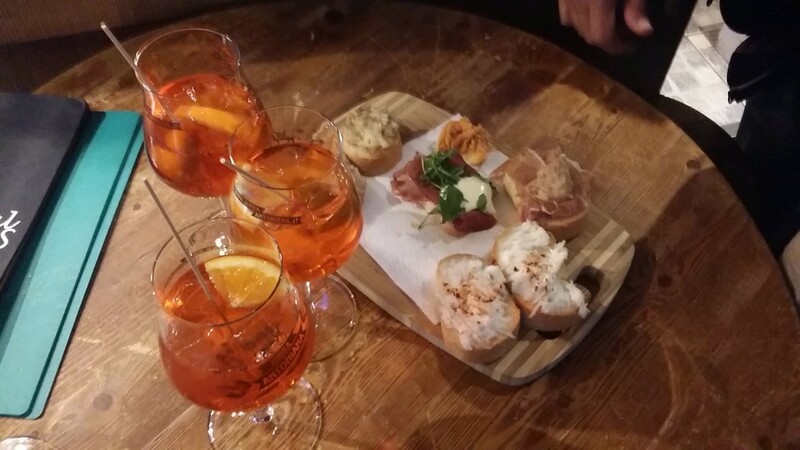 Cicchetti – (Venetian style tapas – small appetizer servings of finger food like variations of bruschetta usually eaten with an Aperol spritz and potato crisps!) 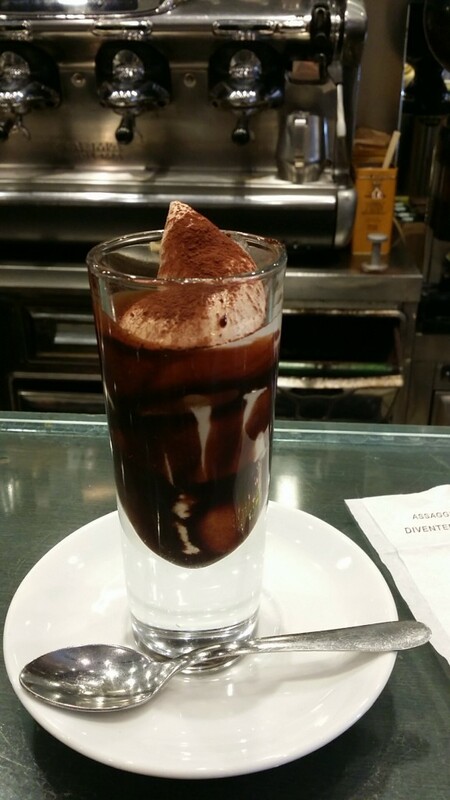 Trying cicchetti is a great way to tap into the Venetian lifestyle. 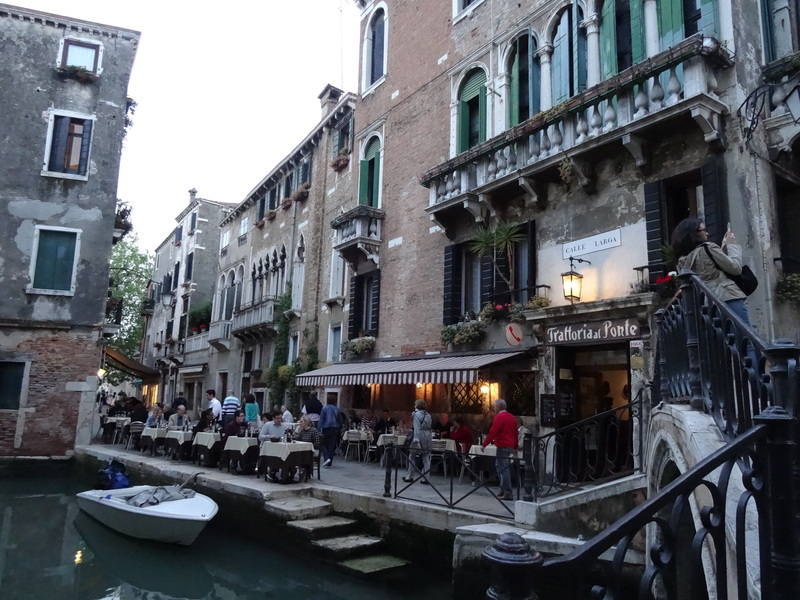 Most Venetian bars will serve cicchetti from late morning to until well into the afternoon. 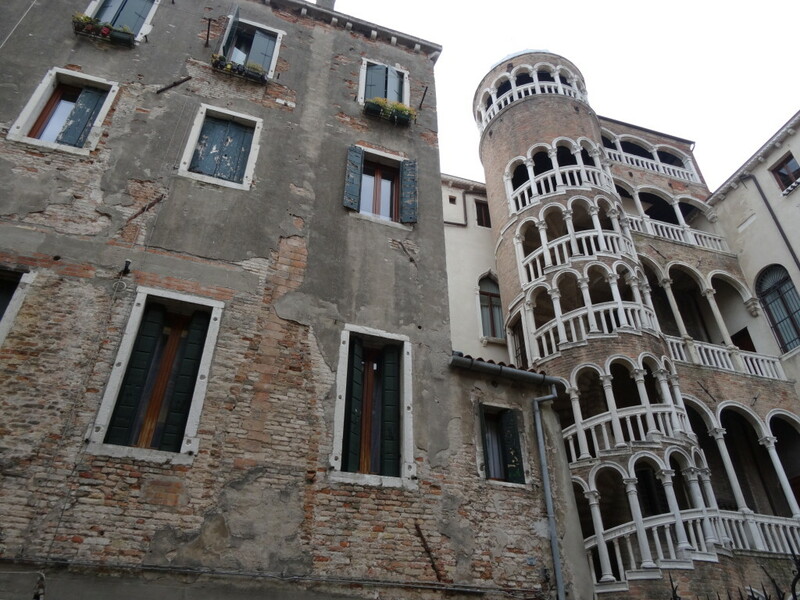 Jewish Ghetto – If you have a spare afternoon or morning this is a beautiful residential area to walk through. 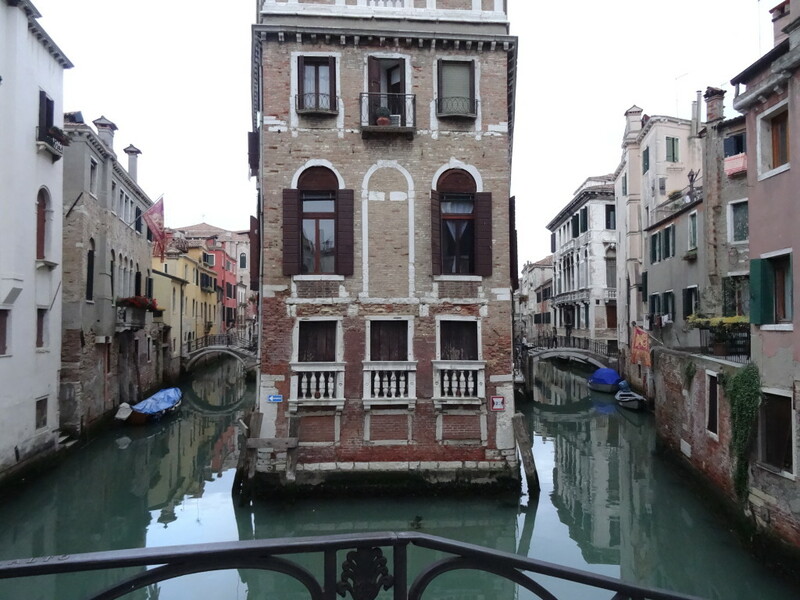 It is moreso a residential area but there are beautiful homes and canals to see. 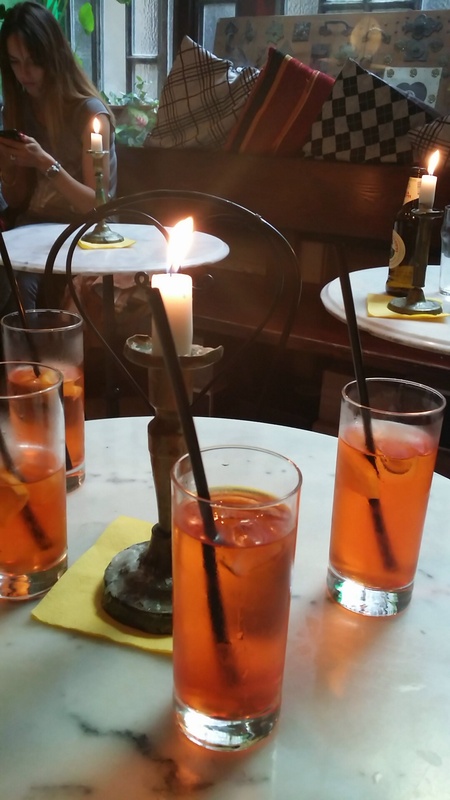 Great spot for apéritifs / drinks before dinner – Aperol spritz for €2, need I say more. 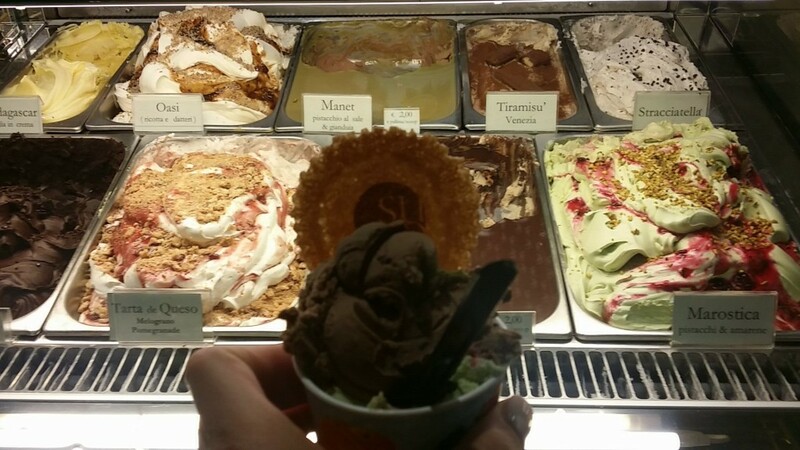 My favourite gelateria in Venice, serving seasonal flavours. I can’t go past their specialty flavour, the ‘Manet’ Pistachio with Salted caramel and Gianduia (the Italian dessert spread made from chocolate and hazelnut). Stumbling upon this place on my first night in Venice was wonderful, such a beautiful setting and delicious, traditional Venetian home style cooking served in a beautiful courtyard. Reasonable pricing, good servings and excellent service. Very picturesque location perfect for a beautiful night when you can enjoy a table outside. Serving homestyle pasta and meat dishes. This is also nearby the extremely popular restaurant ‘La Zucca’ which I heard recommended multiple times but was unable to try myself as it was booked out, so do book La Zucca if you can, otherwise if you turn up and don’t get in like I did, I am sure that Al Ponte Del Meggio will not disappoint. Wonderful inexpensive sandwich place – 1.60 euro for a sandwich. Just be aware they sell sandwiches containing horse meat but have these clearly identified! Probably the best example of creatively embracing the unique environment of the city of Venice. Unmodestly dubbing itself as ‘the most beautiful bookshop in the world’ I am happy to say that so far I would not beg to differ. During Venice’s period of high tide that causes flooding throughout the city, also known as ‘acqua alta’ this charming second hand bookshop designed the bookstore in a way to embrace the high tide occurrence by cleverly shelving books higher than usual above the ground in addition to stacked in bathtubs and gondolas within the store to keep the books afloat during floods. 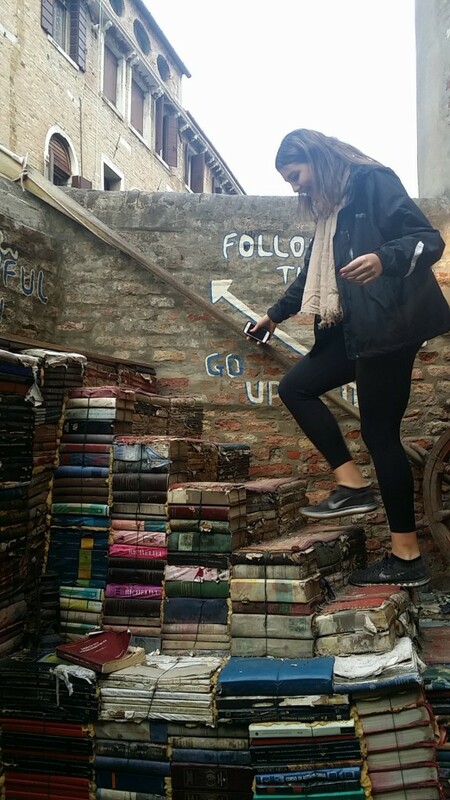 This store is a maze of books which lead to outdoor areas featuring piled up books that had been the victim of flooding, now used as decorative walls and steps. The friendly resident cats quietly strut throughout the store and make sure you head to the back of the store to see their creative fire exit – an entire outdoor staircase made out of old books which lead to the top of the wall to overlook the back exit onto a canal. 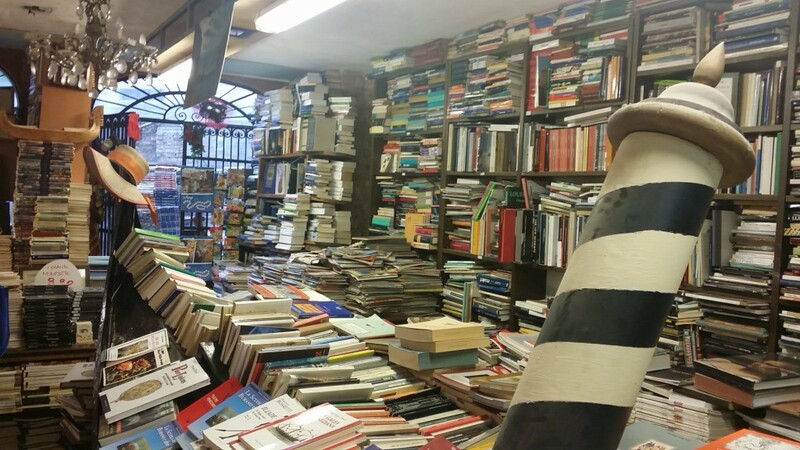 A magical and creative place to visit and get lost amongst the books (maybe even literally). Upfront I will say that this place was my all-time favourite ‘fancy’ restaurant on my whole Italian trip. Our wonderful travel guide suggested this place to us as this was one of his all time favourite places. 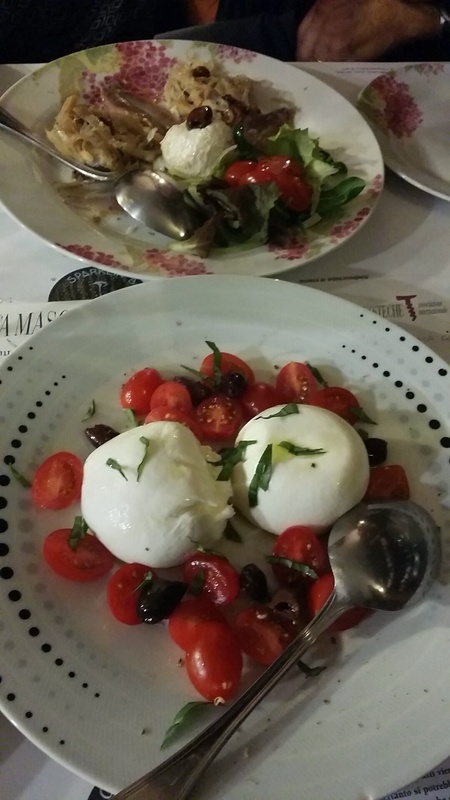 It did not disappoint, it was one of my most memorable meals in Italy (the others being in Sorrento and Santa Margherita as well as my relative’s home cooking of course!) 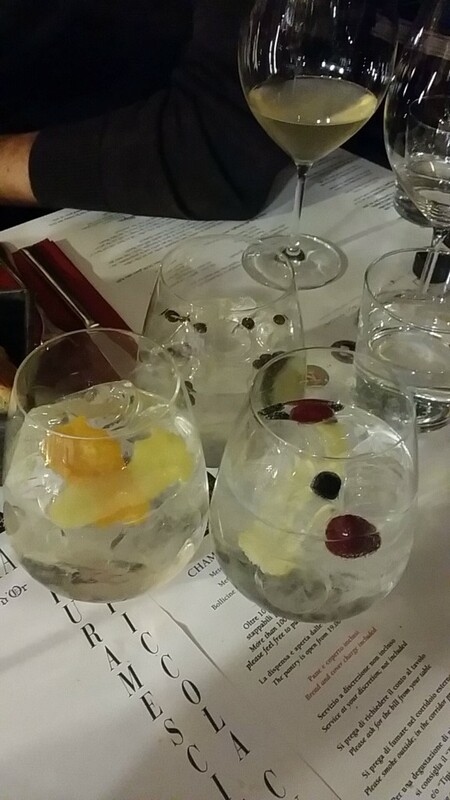 Partner your meal with a gin and tonic, as not only does Enoiteca Mascerata serve up amazing meals but they also specialize in serving the best range of gin. The lovely Paolo came over and asked what tastes we like to drink and magically whipped us up 3 completely different but equally extraordinary gin and tonics each featuring different flavour varieties whether it was citrus and spice, berry and floral or peppery and tart. Our main meals also featured Venetian specialties including baccala, ox cheek and polenta. 3. Scala Contarini del Bovolo (not for the faint hearted or anyone who isn’t whiling to trek it up the long spiral staircase to the top! Venice now has a fixed rate of €80 for a half an hour gondola ride, but the fixed rate does not mean that all rides are equally as enjoyable. There are many overcrowded and not so friendly spots and gondeliers you may see on your walk through Venice, but from what we saw and heard, one of the best (more quieter) places to catch a gondola ride was right in front of the Querini Stampalia in the Campo Santa Maria Formosa – one of the best places to catch a gondola (a bit of a more quieter spot with less traffic, but always ensure to ‘interview’ your gondola driver before you choose them to ensure they are going to provide you with a worthwhile experience and not just ignore you and use their phones during the whole journey. As you are selecting a driver for a memorable (and expensive) experience, there is no shame in taking the time to select a gondola driver, you might want someone who will talk (or sing!) to you during the ride or may be able to provide you with some local knowledge and travel tips for the city or is at least friendly enough to make your €80 half an hour trip an enjoyable one! 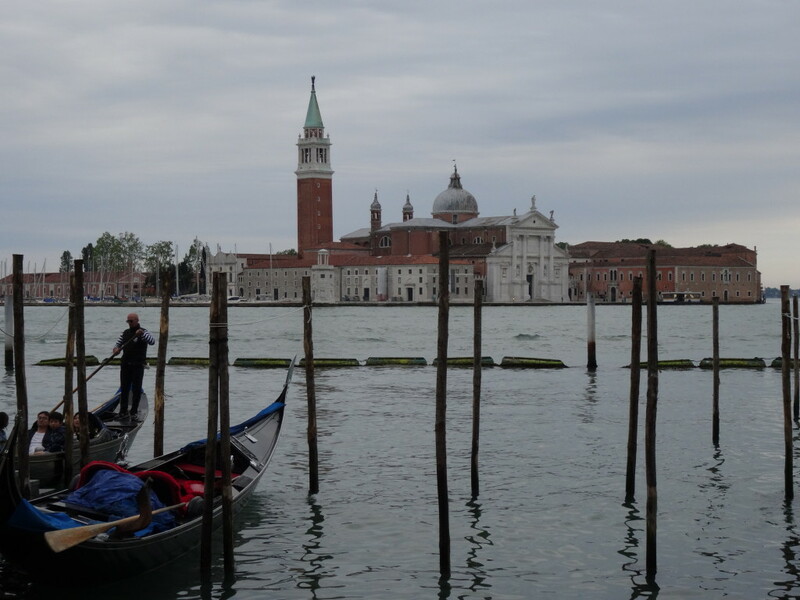 Alternatively, if you are not too fussed on travelling on a gondola ride for half an hour but would still like to enjoy an even more authentic water travel method in Venice, read on about taking a quick trip across the Grand Canal on the Traghetto below. The Traghetto is a public gondola that offers short rides across the Grand Canal. There are only four stations along the Grand Canal where you can take the Traghetto which travels to and from stations across the Grand Canal continuously throughout the day for approximately €2 per single ride each way. The functioning stations and their daily times vary depending on the season so it is advisable to check which stops are in use as well as the hours of operation during your stay in Venice. 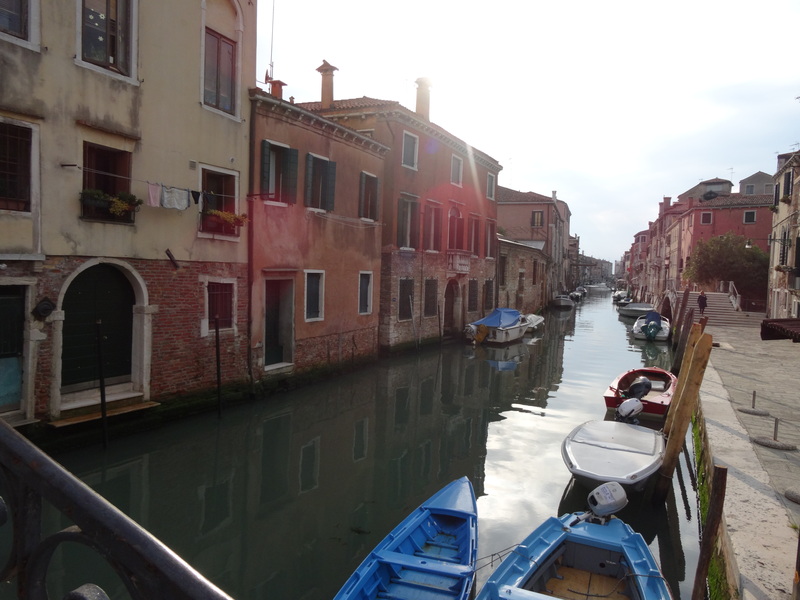 The Vaperetto is the Venice ferry which takes the most wonderfully scenic route via the Grand Canal. I would recommend taking the Vaporetto for the entire route the whole way through from the St Marks Square through the 40 – 60 minute ride it takes via the Grand Canal to the train station at least once. 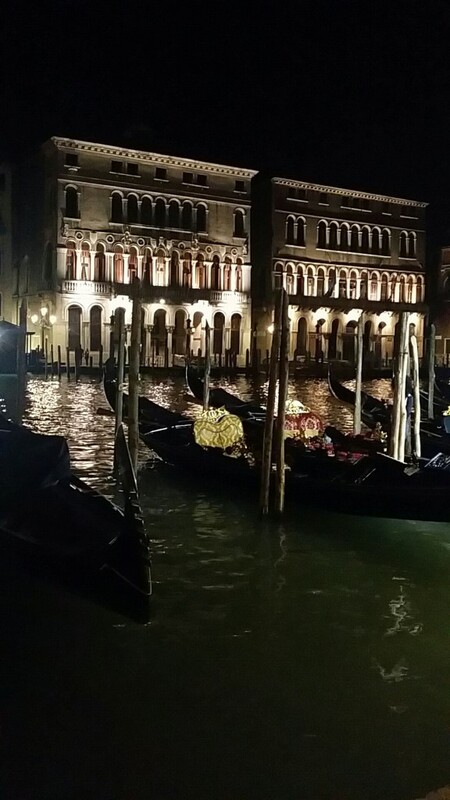 It is a beautiful ride where you can enjoy the best views of the front entrances of all the places situated on the Grand Canal, what is technically the ‘main street’ of Venice. As the front entrances in Venice face the canals, this ride offers you a beautiful different point of view as opposed to walking through the laneways. 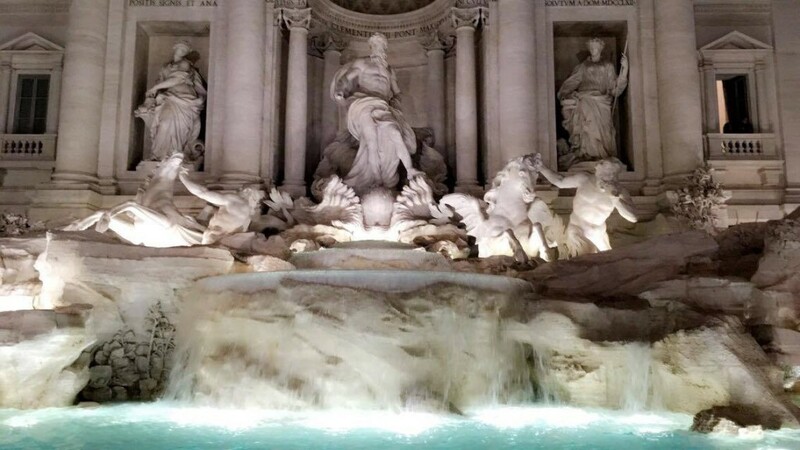 A few months ago in May 2016, I travelled to Italy for the first time. While I usually keep my out of Melbourne travels outside of my blogging for Melbourne Darling, this was a very special trip for me and I was just so overcome by the beauty of Italy I just wanted to share all of my favourite places, travel tips and local treasures for those who may also be interested in some of the same places I went to and things I did. While I love being a tourist and seeing all the popular, iconic and unmissable sights, when I travel I also like to go beyond the typical tourist experience and really seek out the local treasures and seek out recommendations on things to do and visit from those ‘in-the-know’. I always find it extremely beneficial to speak to locals (taxi drivers, store and restaurant owners, waiters, store employees etc.) to get the best, most authentic advice as what I’ve found is that these unexpected places found end up being the most memorable. The series of posts on Italy I will feature are by no means a comprehensive guide and won’t cover any of the main activities or sightseeing but just a selection of some of my most handy tips and favourite places I found along my trip mostly by chance or through recommendations by locals I met along the way, places you may not necessarily find on Tripadvisor or from a hotel or travel guide. Here is my personal favourite collection of the places (mostly food related) I would recommend to my friends and family based on my experience that I’d like to pass on from one Melbourian to the next! 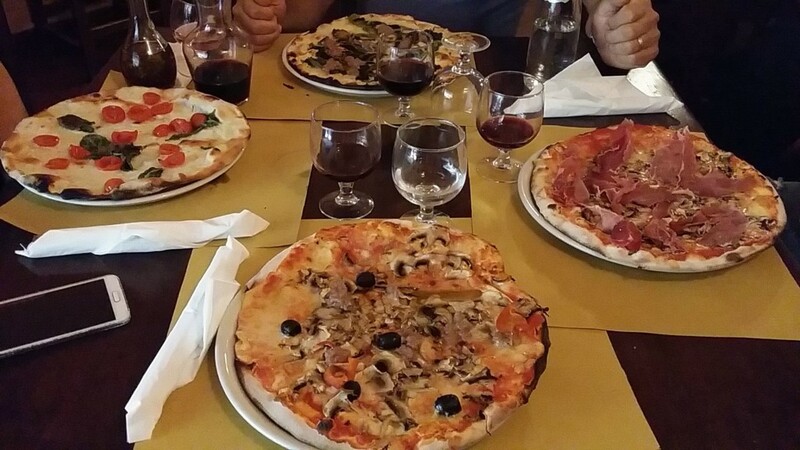 Also keep an eye out for the restaurant’s specialties as we found some restaurants which were fantastic at pizzas made very average pasta or vice versa. Likewise a little knowledge on what vegetables or seafood and types of meats are local and done well in particular areas which could save you the difference between picking a very average meal over a delicious specialty of the restaurant you are dining at. Johnny Gels – These are the slick haired men standing outside the restaurants calling out to passersby in an attempt to persuade them to dine at the restaurant they work for. The good restaurants are usually so busy they don’t need to employ such people to try and entice passersby to walk in. Extensive menus that come in four languages or more – Nothing yells out tourist trap more than a restaurant that chooses to translate their menu in every language to cater for all the tourists. 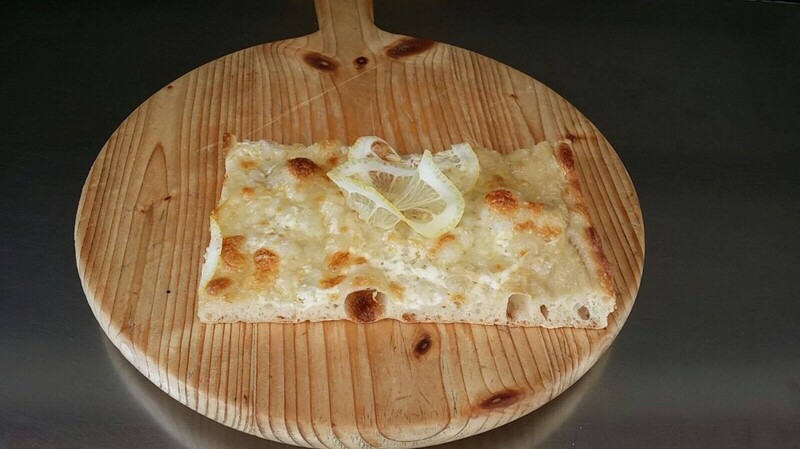 It is rare that you will find locals and authentic Italian food at a place that caters for tourists so heavily. These places are unsurprisingly directly nearby the top tourist landmarks. Photos of food from the menu – Similar to the above point, because when things are in Italian and tourists aren’t sure how to order or what they are ordering, what better way than to just slap photos of the food everywhere so tourists can simply point to the dish they like the look of. Then don’t be surprised when you see the dish that arrives in front of you does not look as perfect as it appeared in the photo. 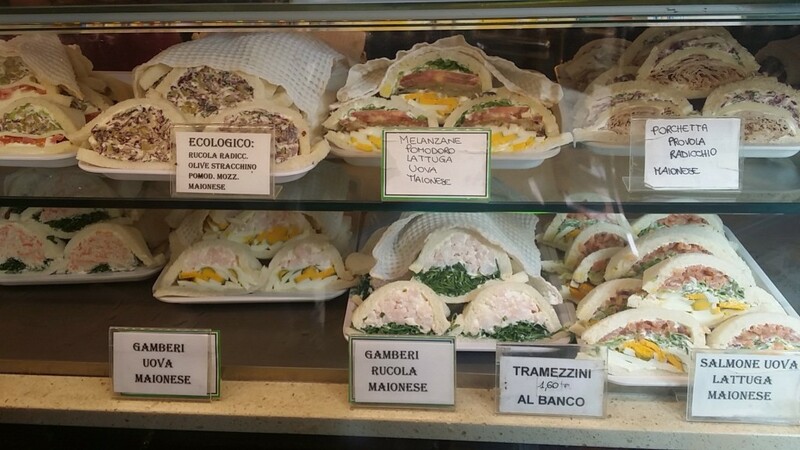 My recommendation for tourists who want to eat more authentic Italian and local food is to ask the waiters what the specialty of the region is or what the most popular dishes at that restaurant are. I also found that having a phone nearby to translate some of the ingredients or dishes is sometimes easier and quicker than asking a waiter to explain if your Italian is not so great. Most big museums offer free admission on the last Sunday of the month which is a good option if you want to visit on the cheap however, if you are not bothered by the entry fee, avoid visiting on weekends or this day when you can expect the biggest crowds. Many tours offer ‘skip the line’ options. This is a worthy option to consider, especially if you are travelling in peak season to not waste valuable time in your tour simply lining up most of the time. Using the toilet facilities – some places will charge you to use the bathroom. The cheapest way to get around this and use the toilets is to go into a café and if you don’t necessarily want to purchase any other drink, order an espresso /short black to stand (not sit!) which should cost on average 1 Euro (too much higher above 1 Euro and you know you’re being ripped off). Hopefully many of the Melbournians reading this have embraced our cities coffee culture and won’t have a problem adding one or more espressos to their day, so worst case if you have a small bladder you may find yourself with a caffeine buzz. On the other hand, the extra pep in your step might just be beneficial for all the walking that’s needed in travelling around, particularly in Rome and Venice! 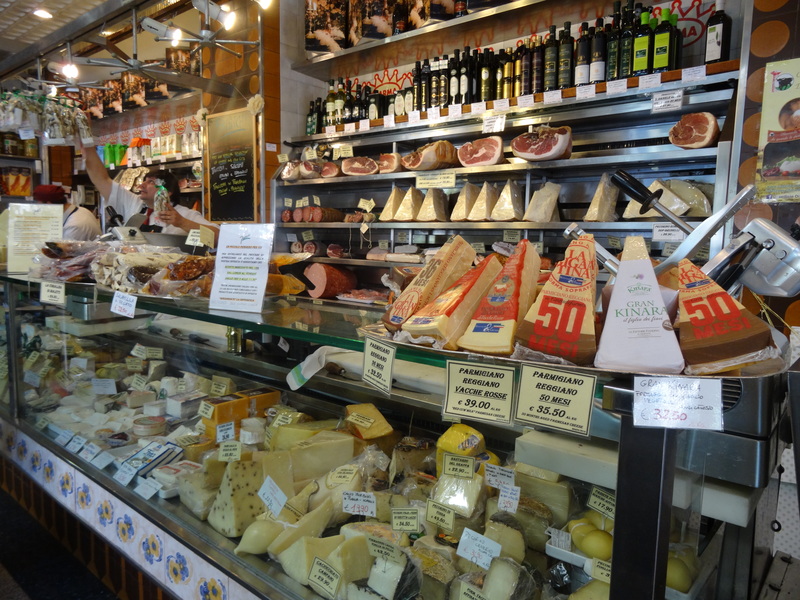 Stop for a glass of wine and a panino at this wonderful deli packed to the brim with breads, cured meats and antipasto treats. 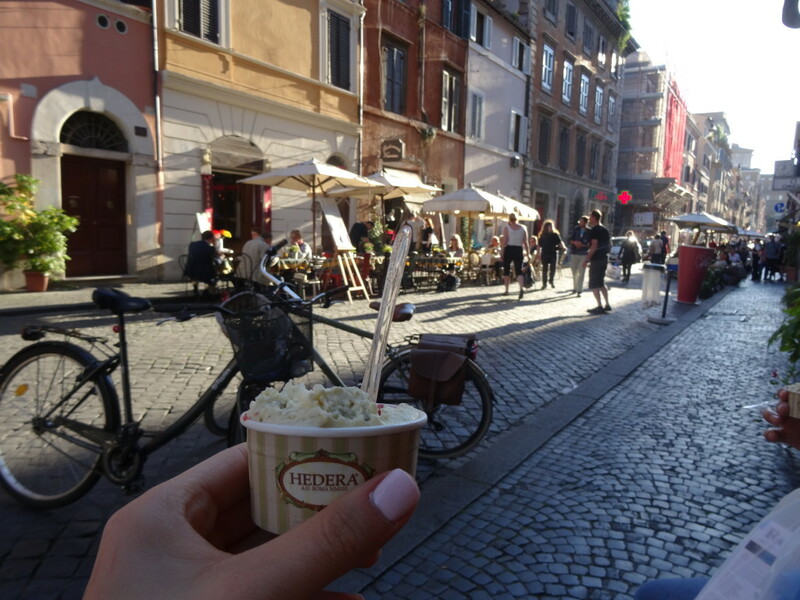 Via Cola Di Rienzo is also a great street to stroll down on your way to the Vatican City or Castel Sant’Angelo. Very cute store interior serving up wonderful gelato and granitas using premium organic ingredients. An extremely handy café serving up everything from coffee to gelato to wine and sandwiches and a big collection of packaged sweets to eat now or bring back home from your travels. Good for a quick snack stop whether you need a coffee, a coffee crema (YES YOU DO) a pastry, sweets, wine, a sandwich or a gelato. Good for a cheap and quick bite of woodfire pizza and wine. Cute, warm and cosy ambience like your stepping into an Italian family’s home. Great pasta dishes. Fresh seasonal produce, particularly mushrooms and artichokes. Generous portions, wholesome, comfort food. 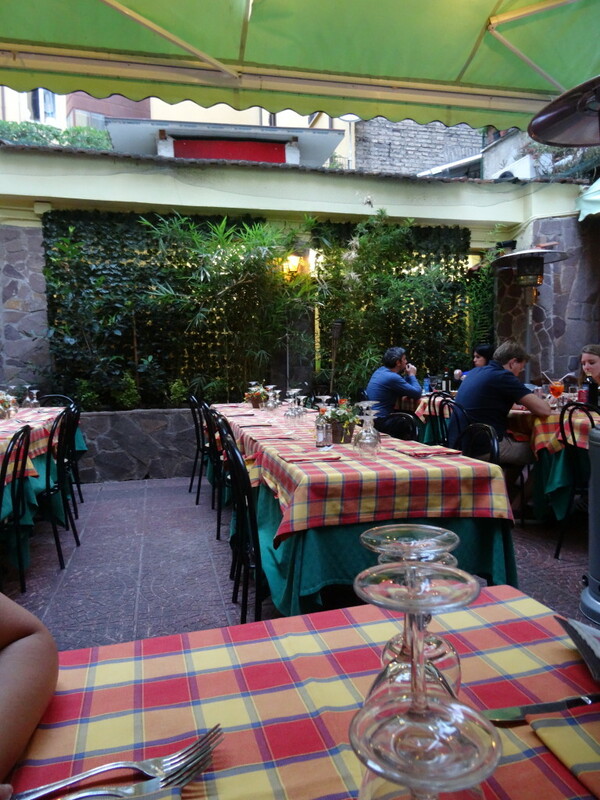 This street – Ristorante Al Boschetto is filled with many good restaurants. I didn’t actually get a chance to try this place as both times I went there they were full! But I heard a few locals recommending this place. 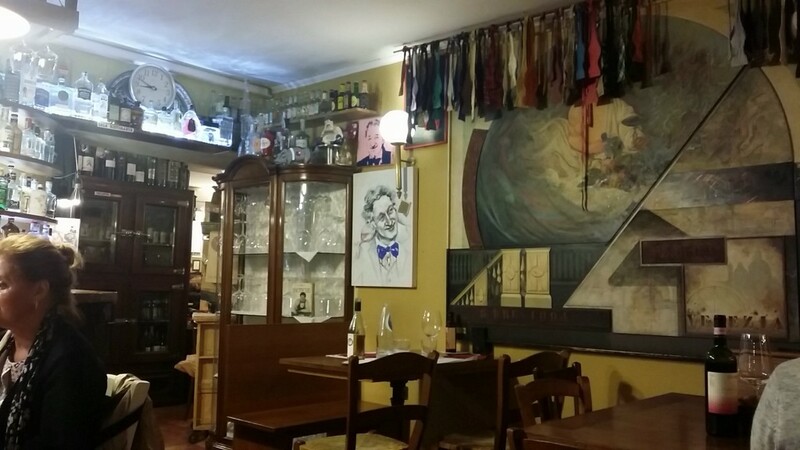 I also heard there are a number of good restaurants and bars in the area of Trastevere if you are up for the walk across the River Tiber which is a less touristy area of Rome where more locals, students and workers reside. 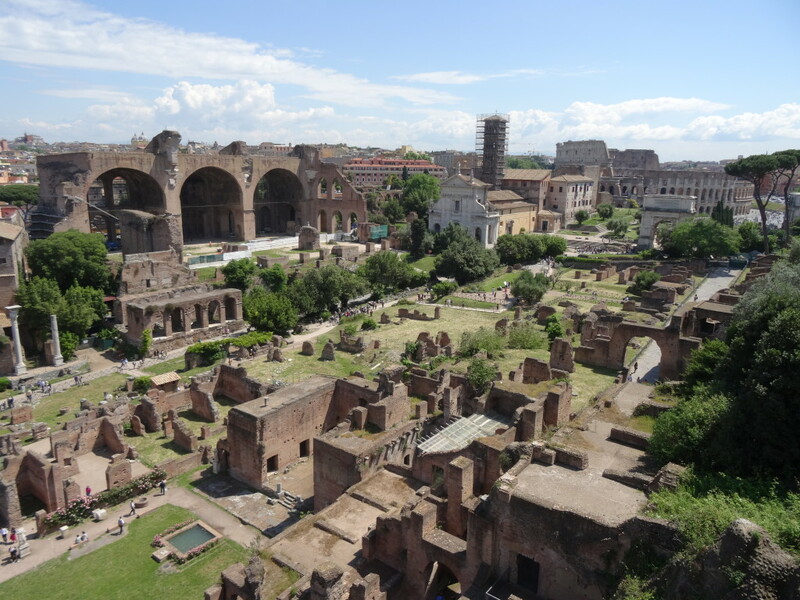 One of my favourite viewpoints of Rome is the Garden of Oranges / ‘giardino degli aranci’ a walk up stairs from the Forum, where you can see a breathtaking view of many major historical landmarks and a beautiful lookout that captures the heart of Rome. Herzel I snow officially my favourite shoe designer. 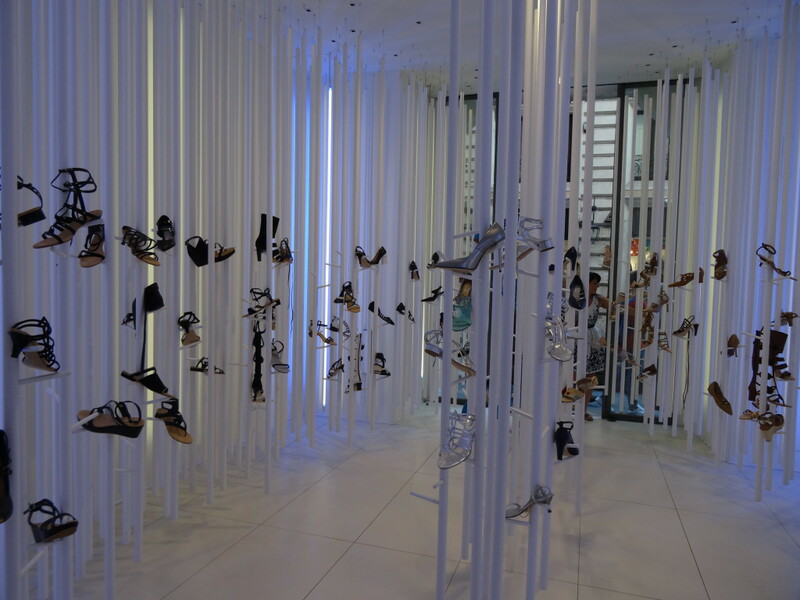 Shoe lovers, fashionistas and design aficionados must visit at least one, if not both stores of this amazing local shoe designer. With only 2 stores in Rome, the care, craft and thought that has gone into the design and production of these impressively flattering (and comfortable) stylishly handmade shoes that are just as exquisite and impactful as the eye-catching store display they are carefully encased in. Please excuse the image of my butchered feet after 3 weeks of solid walking morning until night but I couldn’t resist showing off these amazing pair of shoes with elasticated wrap around ankle straps complete with a metal loop that slides under the heel to secure!